Adams, R. M., 1988, Introductory Remarks: Spatial and Temporal Contexts. In Conceptual Issues in Environmental Archaeology, edited by J. L. Bintliff, D. A. Davidson and E. G. Grant, pp. 1-15.University Press, Edinburgh. Akkermans, P. A., Boerma, J., A., K., Clason, A. T., Hill, S. G., Lohof, E., Meiklejohn, C., le Miere, M., Molgat, G. M. F., Roodenberg,J. J,, Waterbolkvan Rooyen, W., and van Zeist, W., 1983, Bouqras Revisited: Preliminary Report on a Project in Eastern Syria. Proceedings ofthe Prehistoric Society 49: 335-372. 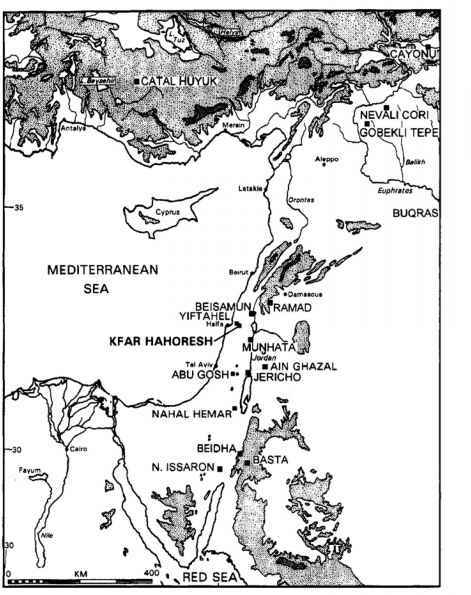 Bar-Yosef, O., and Belfer-Cohen A., 1991, From Sedentary Hunter-Gatherers to Territorial Farmers in the Levant, In Between Bands andStates, edited by S. A Gregg, pp. 181-202. Southern Illinois University, Carbondale, Illinois. Bernbeck, R., 1995, Lasting Alliances and Emerging Competition: Economic Developments in Early Mesopotamia. Journal ofAnthropological Archaeology 14: 1-25. Boerma, j, A. K., 1983, Environmental Conditions. Proceedings ofthePrehistoric Society 49: 362-365. Boerma, J. A. K. 1989-90,Palaeoenvironment and Palaeo Land-Evaluation Based on Actual Environment Conditions of Tell Bouqras, East Syria. Anatolica 16:215 -249. Byrd, B. F., 1994, Public and Private, Domestic and Corporate: The Emergence of the Southwest Asian Village. American Antiquity 58(4):639-666. Byrd, B. F. n.d.,TheNeolithic Village of Beidha: Architecture, Occupation History and Spatial Organization. In The Excavations ofMrs. Diana Kirkbride-Helbaek, by British Academy Monographs in Archaeology. Oxford University Press, Oxford. Carlson, B., 1985, The World's First Formal Architecture? University of Chicago Magazine (fall):8-11. Davis, M., 1991, Social Differentiation at the Early Village of Qayönü, Turkey. Paper presented at the Annual Meeting of the American Anthropological Association, Chicago, Illinois. Esin, U., 1993, Zum Ursprung der Kastenbauweise in Anatolien. Instanbuler Mitteilungen 43:123-128. Flannery, K. V., 1995, Prehistoric Social Evolution. In Research Frontiers in Anthropology, edited by C. R. Ember and M. Ember, pp, 1-26. Prentice-Hall, Englewood Cliffs, New Jersey. Fletcher, R., 1987, Settlement Archaeology: World Wide Comparisons. World Archaeology 18:59-83. Garfinkel, Y., 1994, Ritual Burial of Cultic Objects: The Earliest Evidence. Cambridge Ar-chaeologicalJournal 4: 159-188. Hauptmann, H., 1993, Ein Kultgebäude in Nevali Qori. In Between the Rivers and over the Mountains, edited by M. Frangipane, H. Hauptmann, M. Liverani, P. Matthiae, and M. Mellink, pp. 37-69. Dipartimento di Scienze Storiche Archeologiche e Anthropologiche dell'Antichita, Universita di Roma "La Sapienza,"Rome. Kafafi, Z., and Rollefson G. O., 1995, The 1994 Excavations at 'Ayn Ghazal: Preliminary Report. Annual of the Department of Antiquities of Jordan. 3913-29. Kingery, D., Vandiver, P., and Rickett, M., 1988, The Beginnings of Pyrotechnology, Part ii: Production and Use of Lime and Gypsum Plaster in the Pre-Pottery Neolithic Near East. Journal of Field Archaeology 15:219-244. Kirkbride, D., 1960, The Excavation of a Neolithic Village at Seyl Aqlat, Beidha, near Petra. Palestine Exploration Quarterly 92:136-145. Kramer, C., 1994, Scale, Organization, and Function in Village and Town. In Archaeological Viewsfrom theCountryside: Village Societies in Early ComplexSocieties, edited by G. M. Schwartz and S. E. Falconer, pp. 207-212.Smithsonian Institution Press, Washington. Kuijt, I., 1994, Pre-Pottery Neolithic A Settlement Variability: Evidence for Sociopolitical Developments in the Southern Levant. Journal ofMediterranean Archaeology 7: 165-92. Kuijt, I., 1996, Negotiating Equality through Ritual: A Consideration of Late Natufian and Pre-Pottery Neolithic A Period Mortuary Practices. Journal of Anthropological Archaeology 1 5(4):313-336. Loy, T. H., and Wood, A. R., 1989, Blood Residue Analysis at Qayönü Tepesi, Turkey.Journal of Field Archaeology 16:451-460. Moore, A, M. T., 1975, The Excavation of Tell Abu Hureyra in Syria: A Preliminary Report. Proceedings of the Prehistoric Society 41 :50-77. Moore,A. M. T., 1981,North Syria in Neolithic 2. In Prehistoiredu Levant, edited by J. Cauvin and P. Sanlaville, pp. 445-456. Colloques Internationaux du Centre National de la Recherche Scientifique, No. 598. Editions du Centre National de la Recherche Scientifique, Paris. Moore, A. M. T., 1985, The Development of Neolithic Societies in the Near East. Advances in World Archaeology 4:1-69. Özdögan, M., and Özdögan, A,, 1989, Qayönü, a Conspectus of Recent Work. Paleorient 15:65-74. Quintero, L., 1997,Evolution oflLthic Economics in theLeuantineNeolithic:Developmentand Demise ofNaviform Core Technology. Ph.D. dissertation, University of California, Riverside. University Microfilms, Ann Arbor, Michigan. Rollefson, G. O., 1987, Local and Regional Relationships in the Levantine PPN Period: 'Ain Ghazal as a Regional Center. In Studies in the History and Archaeology ofJordan, edited by A Hadidi, pp. 29-32. Department of Antiquities of Jordan, Amman. Rollefson, G. O., 1992, Neolithic Settlement Patterns in Northern Jordan and Palestine. Stud ies in the Histoy and Archaeology ofJordan IV, edited by S. Tell, pp, 123-127. Department of Antiquities, Amman. Rollefson, G. O.,and Kafafi, Z., 1996, 'Ain Ghazal. Ten Seasons of Discovery ACORNewslet-ter 8:l.
Rollefson, G.,and Köhler-Rollefson, i., 1989, The Collapse of Early Neolithic Settlements in the Southern Levant. In People and Culture Change: Proceedings ofthe Second Symposium on UpperPaleolithic, Mesolithic and Neolithic Populations ofEurope and theMedi-terrranean Basin, edited by i. Hershkovitz. pp. 59-72. British Archaeological Reports, International Series 508. BAR, Oxford. Rollefson, G., and Köhler-Rollefson, I., 1992, Early Neolithic Exploitation Patterns in the Levant: Cultural Impact on the Environment. Population and Environment 13:243-254. Rollefson, G. O., Simmons, A. H., and Kafafi, Z., 1992, Neolithic Cultures at 'Ain Ghazal, Jordan. Journal ofFieldArchaeology 19:443-470. Schirmer, W., 1988, Zu den Bauten des Qayönü Tepesi. Anatolica 15:139-160. Schirmer, W., 1990, Some Aspects of Building at the "Aceramic-Neolithic" Settlement of Qayönü Tepesi. World Archaeology 21:363-387. Schmidt, K., 1995, Investigations in the Upper Mesopotamian Early Neolithic: Göbekli Tepe and Gürcütepe. Neo-Lithics 2/95:9-10. Wright, H. T., ed., 1984, On the Evolution of Complex Societies: Essays in Honor of Harry Joijer. Undeena Publications, Malibu. Yoffee, N., 1993, Mesopotamian Interaction Spheres. In Early Stages in the Evolution of Mesopotamian Civilization: Soviet Excavations inNorthern Iraq, edited by N. Yoffee and J. J. Clark, pp. 257-269. University of Arizona Press, Tucson, Arizona.